Two women chatting about Mary, the mother of Jesus, and her significance. 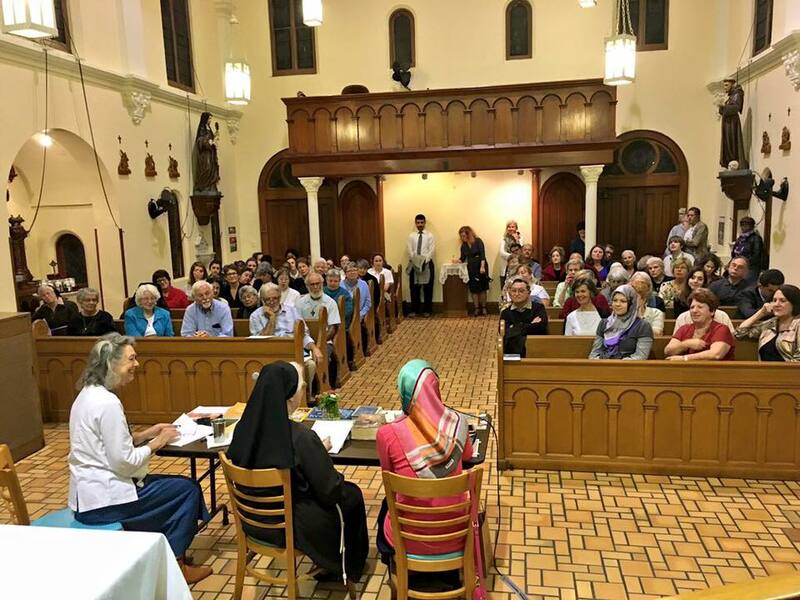 While that doesn’t seem remarkable, one woman was a Catholic nun and the other a Sunni Muslim speaking Dec. 9 inside the St. Clare’s Catholic Monastery Uptown in the company of approximately 75 rapt listeners. Many in the audience were astonished to learn that Christianity and Islam share common ground when it comes to Mary. Franciscan Poor Clare Sister Rita Hickey and Sunni Muslim Merve Gollu, a teacher, revealed how both faiths revere Mary as they discussed Mary’s family; her upbringing; Joseph, Mary and Gabriel; Mary’s pregnancy; Mary at Jesus’ death, ascension and resurrection; and what Mary means to them. “This is a very special thing,” said Orissa Arend, moderator of the Mary talk from Christian and Muslim women’s perspective. One of the first amazing details was that the Koran, the sacred book of Islam dictated to the prophet Mohammed from Allah (God) through the angel Gabriel, has an entire chapter devoted to Mary and the kind of person she was, Gollu said. “There is more about Mary in the Koran than in the New Testament,” Sister Rita said. Gollu first mentioned that Mary was Jesus’ mother and her parents were Imran (the priest Zechariah in the Christian Bible) and Anna (Anne in Christianity) who was post-menopausal and unable to conceive. Anna’s ability to conceive is considered a miracle in Islam, Gollu said. During her pregnancy, Anna thought she might be carrying the Messiah, since he was believed to be coming soon. Mary was from the prophet David’s lineage, according to the Koran. As for her other relatives, Elizabeth was Mary’s aunt (Anna’s older sister) in the Koran, while Elizabeth was Mary’s cousin in the Christian Bible. Both agree that Zechariah was her husband and that Elizabeth, who was barren, was John the Baptist’s mother who believed – in both faiths – in Mary’s miraculous conception of Jesus. Christian legend has it that Mary was taken to the temple where she lived and was taught by Zechariah until she married Joseph, Sister Rita said. The Koran said she was the only girl taught in the temple. Zechariah defended Mary’s childhood presence in the temple, saying if God wanted her to be there, she could stay and made a room for her. Both believe that Mary was sinless from birth – the Immaculate Conception. Joseph is not considered her husband in the Koran, only a man who studied in the temple and became her guardian possibly after Zechariah’s death. Gollu mentioned that Josef questioned Mary about being pregnant after she returned from seeing Elizabeth asking, if there has ever been a tree without a seed or a child without a father? Mary, in the Koran answers, “Yes,” and said God, the most high, created Adam without a father and mother, and Joseph believed her. Muslims believe in the Virginal incarnation of Jesus and that Mary was a virgin her whole life and is alive in heaven (in paradise). They don’t believe in Jesus’ resurrection, per se since he didn’t die, but that he came back and told Mary and Mary Magdalen that he was in heaven with God. Muslims believe that he will come again on Judgment day. Sister Rita said she met Gollu at an interfaith talk at Loyola University. An imam brought up Mary’s importance to Islam, prompting Gollu to introduce herself to Sister Rita – recognized as a Catholic nun dressed in a habit – mentioning a shared interest in Mary. Arend knew Gollu’s husband, Gultekin, from the interfaith Atlas Foundation, and a public discussion on Mary emerged. Over the past months, Sister Rita and Gollu met to discuss their faith’s view of Mary. They structured their talk based on their discovery of shared stories about Mary in the Bible and the Koran with some variances and how the Koran was dictated to Mohammed directly from Allah (God) through angel Gabriel and not inspired by God through the apostles’ word as is the Christian Bible. Gollu said in the Koran, Mary wasn’t anticipating angel Gabriel to tell her she was expecting a child without a father and was shameful, but Gabriel told her it was Allah’s instruction. Muslim scholars differ on her length of pregnancy from six or almost ninths months. In the Koran when Mary contractions began during labor, she left the temple in shame and sat under a palm tree alone to have the Messiah. Allah sends her water and food, and Gabriel instructs her to return to the city and reveal the Messiah. Gollu read from the Koran that people were asking “how can we talk to the one in the cradle” and the baby Jesus talks to them,” one of his extraordinary acts. In Christianity, Mary travels from Nazareth to Bethlehem where the baby Jesus is born in a stable. He is raised as a regular person but displays miraculous powers at times. Sister Rita sees Mary as a prophet, the perfect follower of Christ and an example for all Christians due to her complete openness to Christ. Gollu said the Koran doesn’t not call Mary a prophet, but a “symbol of purity” to whom angel Gabriel spoke. Arend asked Gollu how Muslims view the death of Jesus. She surmised that Jesus didn’t die on the cross. Somehow Allah substituted Judas interposed with Jesus’ face so it was believed it was Jesus on the cross. The discussion ended with what Mary means to them. Mount Carmel Academy seniors attended the talk as part of their world religion class. They were astonished to learn how the Koran has a whole chapter devoted to Mary and how some of the stories about her that they know from Christianity coincide with Islam. “The stories that they (Muslims) have, some are similar to our beliefs,” senior Lauren Robicheaux said. Father Buddy Noel, the ecumenical and interfaith director for the Archdiocese of New Orleans, who organized the event with the Atlas Foundation, suggested hosting similar talks, possibly quarterly. He can be reached at 341-9522.